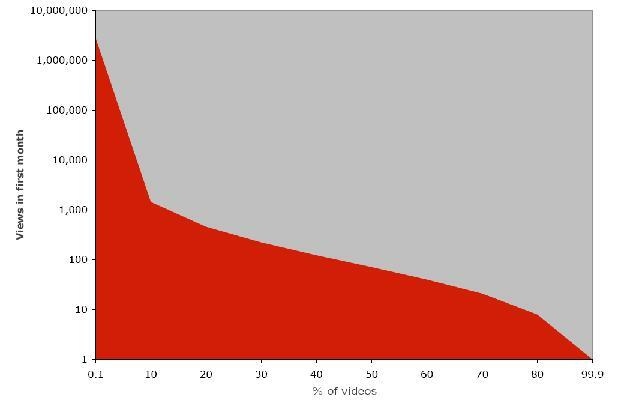 The graph below shows mentions of either the YouTube founders in context where the other is absent. The first peak is around the acquisition, the second around the OgivlyOne Digital Media Summit and the third around the Davos World Economic Forum. From here, it certainly seems that one of the founders is getting more attention - at least from the blogosphere - than the other. 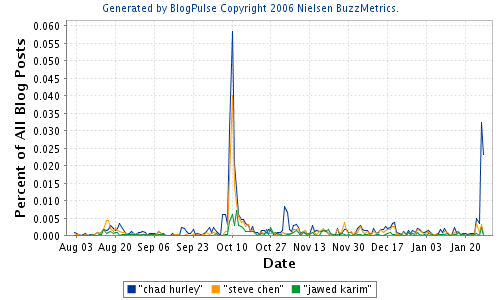 A second graph, below, shows simple mentions of the founders (this time I've included Karim). 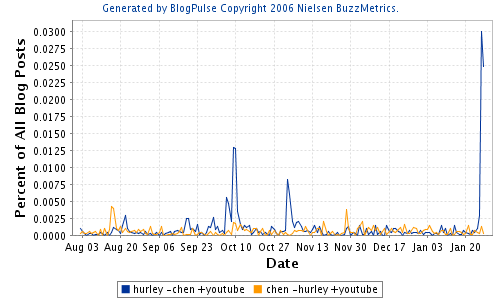 Again, a distinction can be seen between Hurley and Chen. 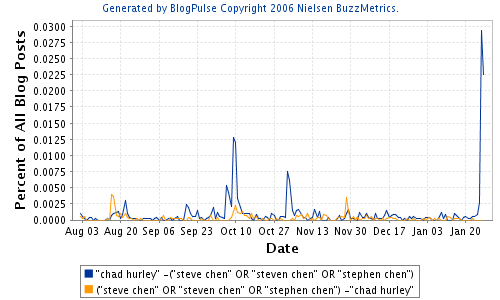 A little more investigation shows that the variations of Chen's name are important to capture. 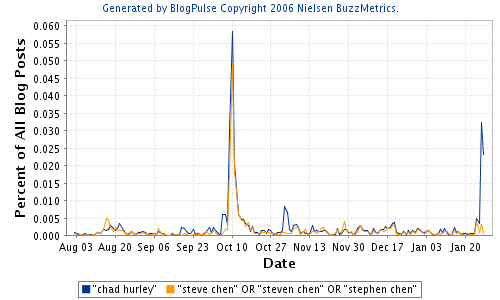 The above graphs, however, seems consistent with the hypothesis that Hurley is the one they send off to high visibility public events. 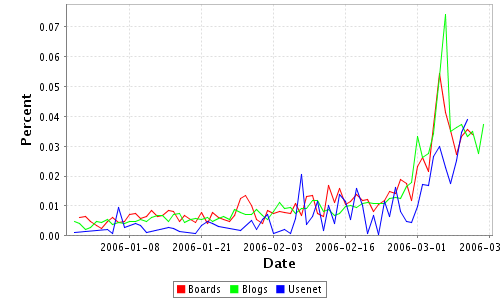 Again, here is a graph which looks for exclusive mentions. Brin and Page have been far more consistent in their attention. Update: I've updated this post with a more current version of the trend graph. (MOUNTAIN VIEW)—Google Inc., announced today that it has agreed to acquire YouTube, the consumer media company for people to watch and share original videos through a Web experience, for $1.65 billion in a stock-for-stock transaction. Following the acquisition, YouTube will operate independently to preserve its successful brand and passionate community. 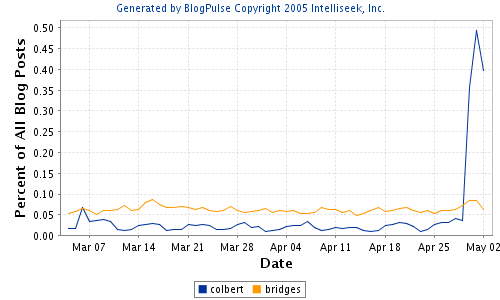 So, why is Colbert pulled from YouTube, but Bridges isn't? Kevin, in a comment on this blog, points out that TailRank actually had video ranking first, they just didn't publicize it well. Have a look at http://tailrank.com/posts/filter/handle/_video. There are some noticable differences. TailRank looks at more than just references to YouTube and includes at least Apple and Google Video - though the data is swamped by YouTube. 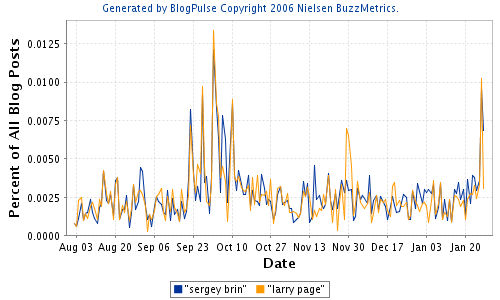 Technorati's service has a shorter window giving a view of the last 48 hours compared with TailRank which has a window of several days (at least 5). It looks like there are considerable differences in the data - probably due to different crawling strategies - only two of the videos are found in each list. 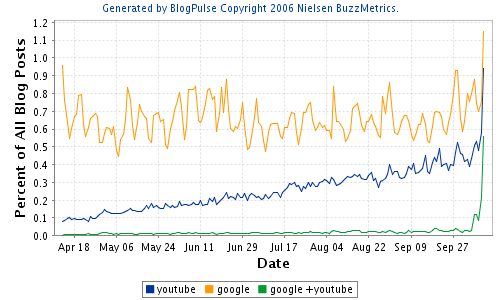 Technorati has a neat new page which lists the most popular YouTube videos. I guess it was never a matter of when a page like this would appear, just a matter of who would get there first. Congratulations to Technorati! I wonder if we will see this picked up by the memetracker crowd as well. Currently, the model in that space is to filter by content type (giving us, for example, different flavours of Memeorandum and TailRank filtered by tech, politics, etc.) The video list suggests a different model which is to filter by the media type (similar to BlogPulse' filtering by blog and news links). Seems you can't keep a good clip down. 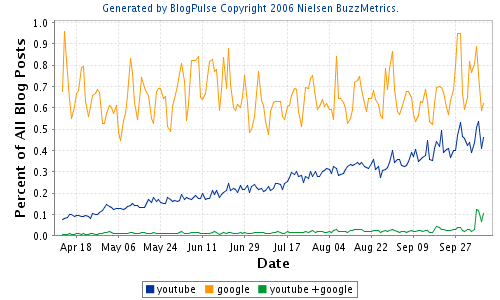 Approximately, the blue line represents mentions of YouTube and the yellow links to YouTube and probably YouTube hosted content. 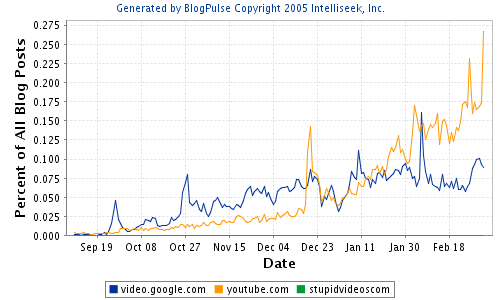 Perhaps BlogPulse needs to have a new ranking for just YouTube videos. How much of YouTube's success is to do with the use of a Flash delivery device and low resolution resulting in low barriers to viewing?